Update 5/25/2012: Just had someone reach out to me today in regards to a file size issue with the extract. They were stating that it required 6PB instead of 60GB of space. When doing the extract they were using the built-in extracting within Windows 7. I had used WinRAR without any issues. They downloaded that tool and successfully extracted the files. Just wanted to make mention of this in case anyone else runs into an issue like this. After I heard that the new version of the Microsoft Business Intelligence VHD was available I downloaded it to check it out. The major change was that it now had the RTM release of SQL Server 2012 all setup on it. 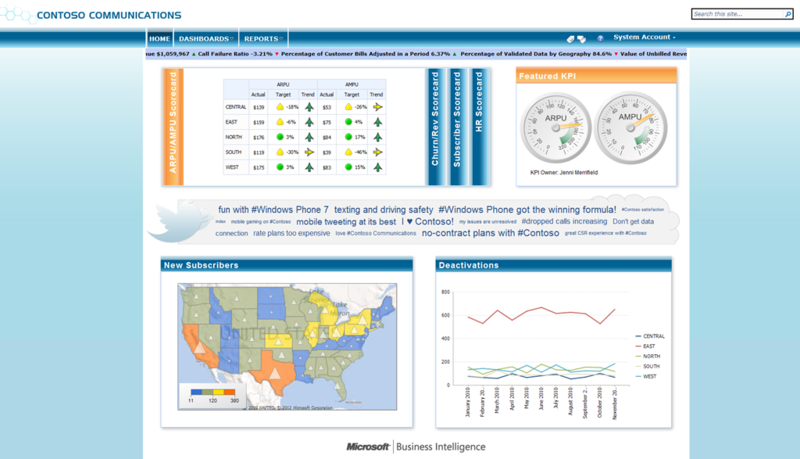 You can check out the new demo solution in the catalog here http://mssalesdemos.com and you can download it from here http://www.microsoft.com/betaexperience/pd/BIVHD/enus/. You can download the VHD Hyper-V image, the zip file is 21.6GB and when you extract out the contents you will need approximately 58GB of space (and you will also want some free space as well because the image is setup to grow out to 250GB if needed). The recommended memory to run this is 8GB, but unfortunately I don’t have that available, so I tested it out with only around 4.5GB of RAM and devoted 2 processors to try and run it with VirtualBox. Now since I am using VirtualBox I disabled all of the Hyper-V services along with some additional ones that are not needed to save on some RAM like Remote Desktop services and Windows Defender. 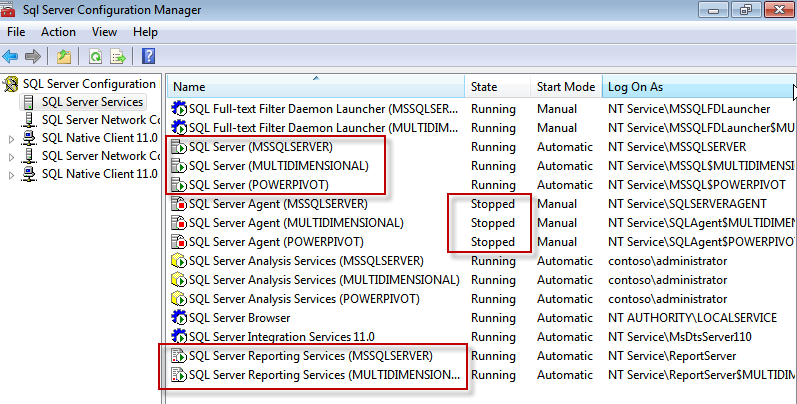 I then took a look at the SQL Services setup and … grrrr … noticed that there are just a few, like three instances. 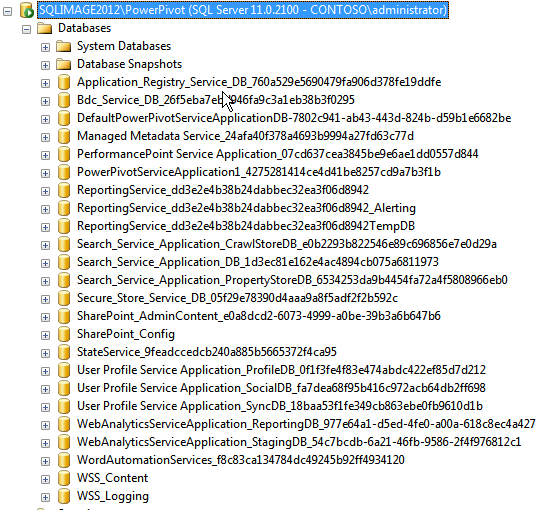 By this I mean there are three instances of the DB engine (which are definitely not needed), none of the SQL Agent services are running, all three of the SSAS services are running which is good, and they also have two instances of SSRS running (no idea why, similar to the DB engine setup). If you are not going to be doing any DQS you can safely shutdown the Multidimensional instance until you are ready to do so (free up a little more memory). 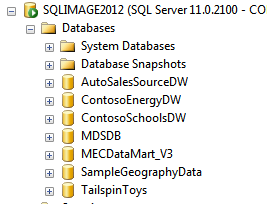 In looking at the database names I don’t see the SSISDB catalog, so I guess there are probably no demos of any Integration Services. The top one is the Multidimensional instance, the second one is the PowerPivot, and the third instance (the default) is Tabular SSAS. So the majority of the data and memory consumption is happening in the PowerPivot and Tabular databases which makes since with the xVelocity in-memory database technology at work here. Probably don’t need either of these running and by looking at the database names I only see the databases setup for the new SharePoint Integrated mode setup as the Shared Service Application. So you could safely shut both of these down for the time being as well. 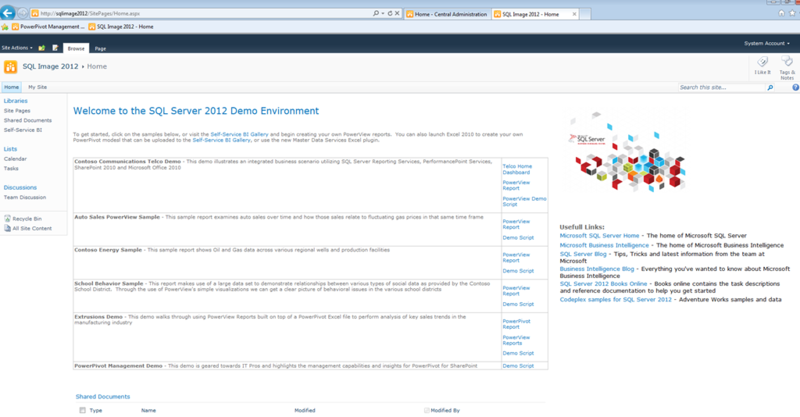 Well how about we take a look at the SharePoint setup and some of the demos. In attempting to go to the SQL Image 2012 home page (http://intranet.contoso.com/SitePages/Home.aspx) I got that the page could not be displayed. 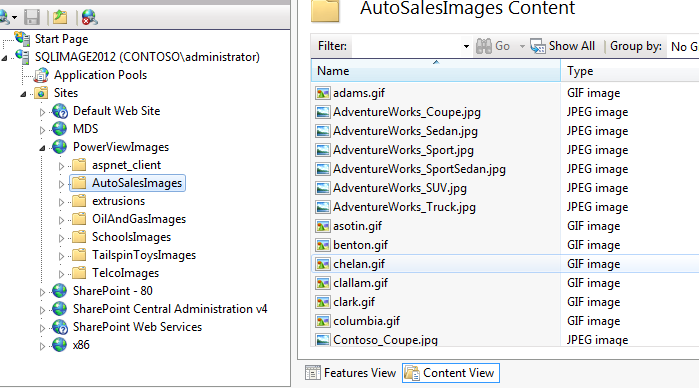 So I went to the localhost or server name page instead and it worked just fine (http://sqlimage2012/SitePages/Home.aspx). Without troubleshooting this further I went with the server name setup and had to modify my connection and URL references for the Power View reports. Well that is the quick overview of the new XII image. There is plenty more and I will keep exploring and leave some for you to check out as well, enjoy!